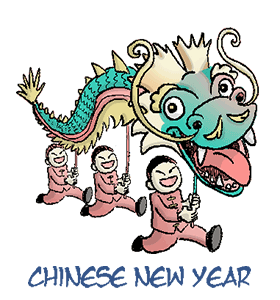 ﻿Chinese New Year: Calendar, History, Tweets, Facts, Quotes & Activities. Chinese New Year or Spring Festival celebrates a year of hard work and gives people the opportunity to wish for a lucky new year. It is China's most important festival and involves family reunions, elaborate decorations and giving red envelopes. Chinese New Year is based on the Chinese Lunar Calendar and usually falls between January 21 and February 20. In 2017 Chinese New Year is celebrated on January 28th. The Calendar functions on a 12 year animal cycle that many associate with the celebration. 2018 is the Year of the Dog according to the Chinese animal zodiac cycle. 2019 is the Year of the Pig. The names of the Chinese calendar are repeated every 60 years. The Chinese New Year is celebrated as the Spring Festival in China. It is the nation's most important festival. Every child receives a monetary gift for New Year. The gift is wrapped in a red envelope. Sing a popular Chinese New Year song called Gonf Xi Fa Cai. Clean your he house. It is customary for Chinese to clean their homes in preparation for the New Year and the fresh start. Prepare your red envelopes for the kids. This is considered lucky money for children. Attend a Chinese New Year Festival in a town near you. Most large cities in the US have a Chinatown district that will host events and pageants. Get together with friends and create a long dragon on sticks. One person gets to create the head, and the remainder create the long flowy tail. Remember to use bright colors.